Planet Earth has a plastic problem. Particularly our oceans are becoming increasingly polluted with plastic and general waste, which is why the Ocean Conservancy hosted an international cleanup event last year. Over half a million volunteers participated in the 2012 International Coastal Cleanup, covering a distance of nearly 18,000 miles. Not only did the findings of last year's cleanup show the pressing necessity of saving our coasts from further pollution, which has been allowed to progress to horrific levels, but they also revealed the impact our everyday lives and the products we use have on the environment. 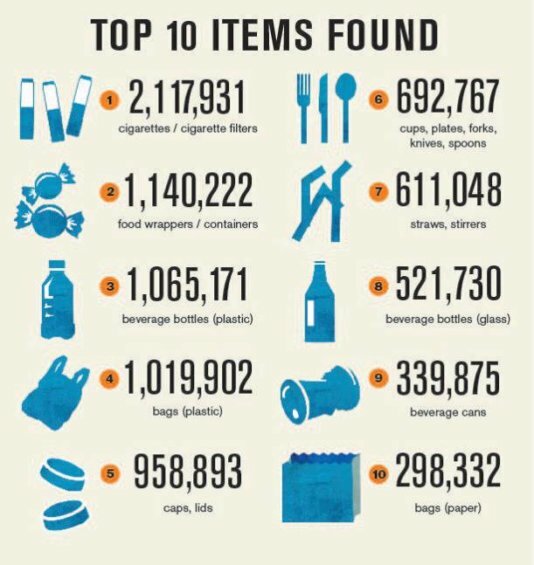 The Ocean Conservancy compiled a list of the top 10 items that were found. Five out of ten are plastic products. The number one item found on the clear-up was cigarettes/ cigarette filters. Over 2,117,000 were found in the coastal clear-up. They make their way through drains and gutters and find themselves in the ocean. Animals and birds can mistake the butts for food and ingest them, along with the toxins present in cigarettes. The next worst offending ocean pollutant are food wrappers/ containers. 1,140,222 food wrappers were found in the International Coastal clear-up and it shows the evidential problem we have with plastic in our ocean. Most of these wrappers are not bio-degradable and just sit at the bottom of ocean floors, waiting for a sea animal to potentially ingest and choke on them. The number of plastic bottles being sold is predicted to rise even higher in future years. Around 20,000 bottles are bought every second which leads to a colossal amount of plastic waste which ends up in the ocean. Research by the Ellen MacArthur Foundation predicts that by 2050 the amount of plastic in the ocean will outweigh the amount of fish in the ocean. Around 1,065,171 beverage bottles were found in the ocean clear-up. Over a million plastic bags were found in the ocean clear-up. Sea animals are regularly found to be tangled up in plastic bags, with some even being choked to death by them. Bottle caps are small enough to be swallowed whole by birds or sea animals. This type of pollution can jam animal airways, or sit in their digestive systems causing them great discomfort and pain. 958,893 caps / lids were found in the clear-up with many more still in the sea. Cutlery and cups numbered in the hundreds of thousands (692,767) in the ocean. Sharp objects which are not bio-degradable can last in the ocean for hundreds of years and can cut or injure sea animals in the ocean. Plastic straws are on the way out, thankfully. However, the previous damage to the ocean by plastic remains as can be seen by 611,048 straws / stirrers being found to litter the ocean. Even if plastic straws have no place in our future, there are still hundreds of thousands of them still left in our oceans from our collective past. Towards the bottom of our list, we see glass beverage bottles being picked up 521,730 times in our oceans. Glass may sink, but it never disappears. Those who say that glass is made of sand forget that humans add things to it for aesthetics or functionality. 339,875 beverage cans (made of metal) were found to be lining the ocean. Metal cans are lined with cerated edges which can injure animals, just like cutlery and glass. Last on our list of waste in the ocean, is paper bags. People tend to forget that paper bags can possess a higher carbon footprint than plastic bags. It's not just plastic bags we need to be aware of therefore, but paper bags too. Where we can, we need to ensure we recycle all our items. The next scheduled International Coastal Cleanup is due to take place on the 21st of September 2013.